This week's release of Ryzen CPUs enabled with Vega-class graphics has brought renewed focus to the AMD AM4 platform for users dipping their toe into mainstream computing. The Ryzen 5 2400G and Ryzen 3 2200G, priced at £150 and £90, respectively, offer a means of building a capable PC without breaking the bank. 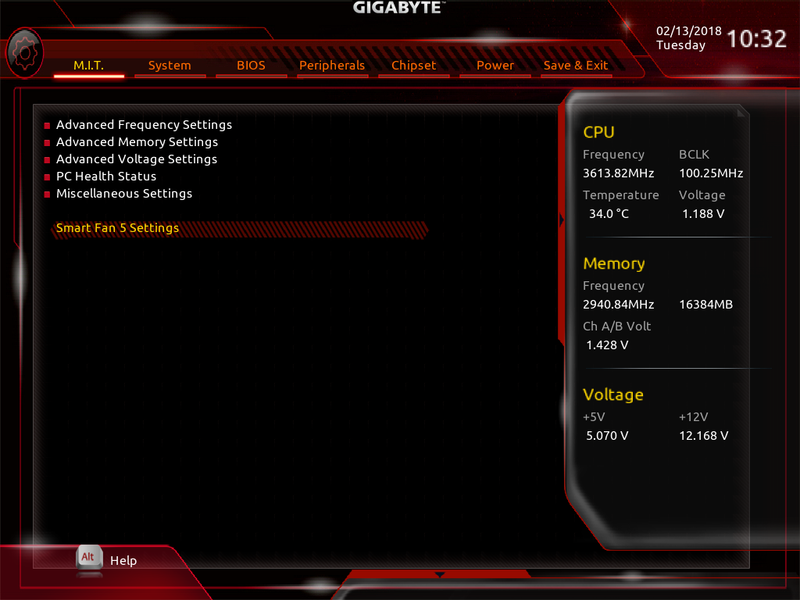 And that very integration of CPU and GPU removes the need for a discrete video card for many. 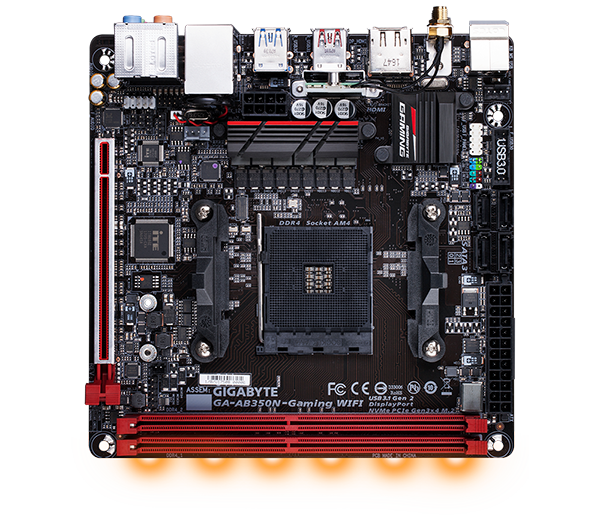 Smaller-form-factor AM4 boards are in an ideal position to capitalise on these new chips, so we have the Gigabyte AB350N-Gaming WiFi in for technical evaluation today. This mini-ITX board, costing £100, supports all AM4 processors with the latest BIOS, so you can go for a Ryzen 3 today and, when funds permit, opt for a Ryzen 7 at a later date. 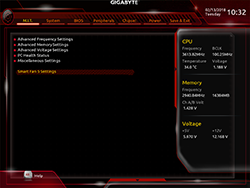 Of course, choosing a G-series chip removes the immediate need for separate graphics, too. The AM4 socket necessitates some interesting design choices. The heatsink-clad PCH is moved up to the top-left, as we look at it, but there's still room for another heatsink on top of the 4+2-phase power supply. The auxillary 8-pin EPS connector, which is good to see on a tiny board and useful for overclocking the CPU, is usually on the edge, enabling easy cabling, though Gigabyte finds just enough space to locate it between the rear I/O USB ports and aforementioned heatsink. It's actually pretty easy to clip the cable in or out, yet do be aware that the build won't look as tidy due to pulling that wire across. Having the four SATA ports on the top edge also make having an ultra-tidy build somewhat difficult. 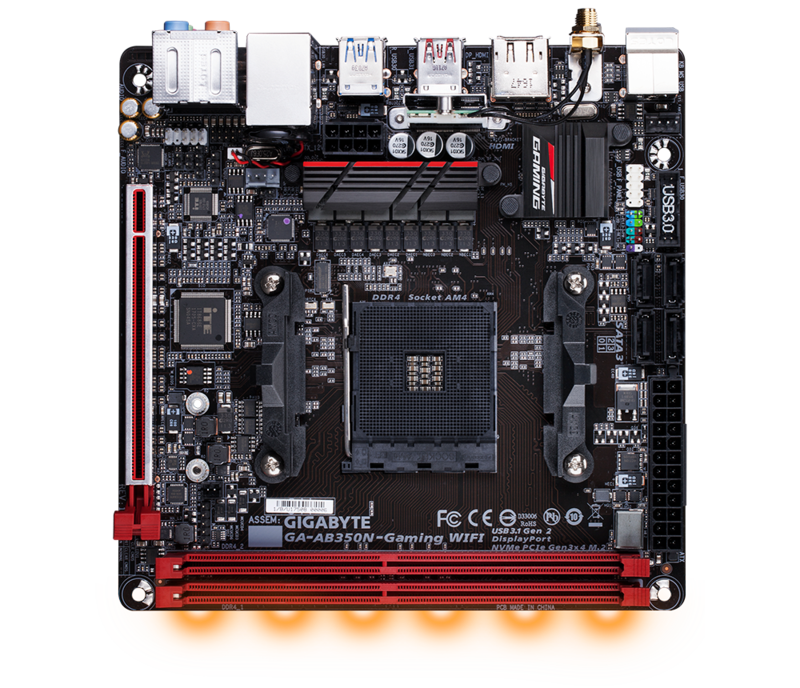 We expect most users to go for a single M.2, provided here by a slot on the back - a method that has become popular on mini-ITX. 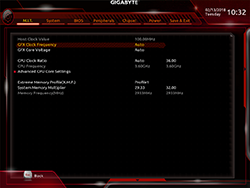 Supporting both SATA and PCIe x4 NVMe drives, the only thing to note is that maximum length is 80mm (2280), though most consumer drives are available in this form factor. Also worth knowing is that you can only use a couple of SATA ports if the M.2 is run in the preferred full-speed NVMe mode. You might think that RGB falls by the wayside this time around. Wrong, as the board features six LEDs evenly spaced underneath the dual DIMM slots. Colour control for these is available via the BIOS, along with the ability to select various operating modes. At default, the red colour offers a nice ambient glow rather than piercing your eyes with ultra-bright coverage. An onboard RGB-5050 header, located just below the CPU fan, enables you to add a light strip to further augment visuals. 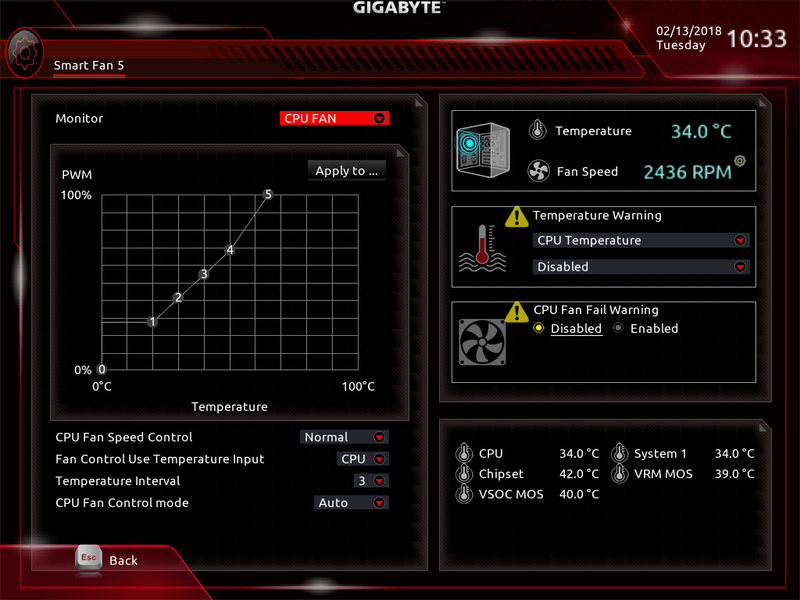 That, or use it for lighting present in one of AMD's newer coolers. Keeping the features going, the board has the same Realtek ALC1220 codec found on most mainstream models. Realtek also provided the Gigabit LAN, while the chipset's dual USB 3.1 Gen 2 (Type-A), dual USB 3.1 Gen 1, and a quartet of USB 2.0 are all accounted for on the back. Cooling wise, a second 4-pin fan header also finds a home, but we would have appreciated another for focussed airflow. 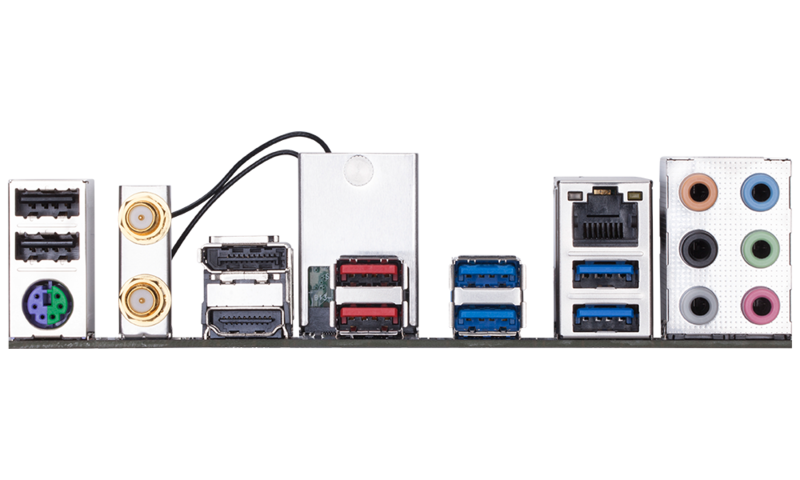 DisplayPort and HDMI are important because they provide the conduit for exporting video from the Ryzen G-series chips. Gigabyte includes the required antenna for the combo 802.11ac WiFi and Bluetooth, but not much else of note in the bundle. 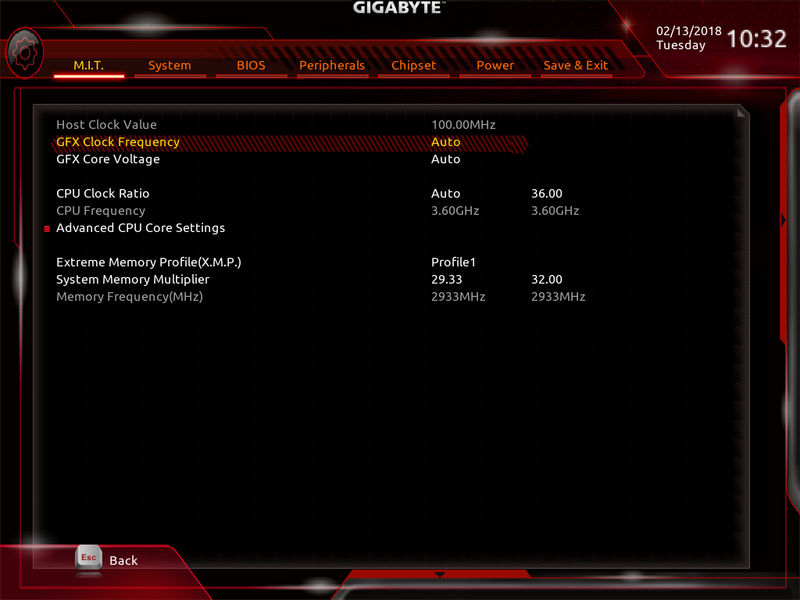 Gigabyte's firmware is simple yet still reasonably comprehensive. 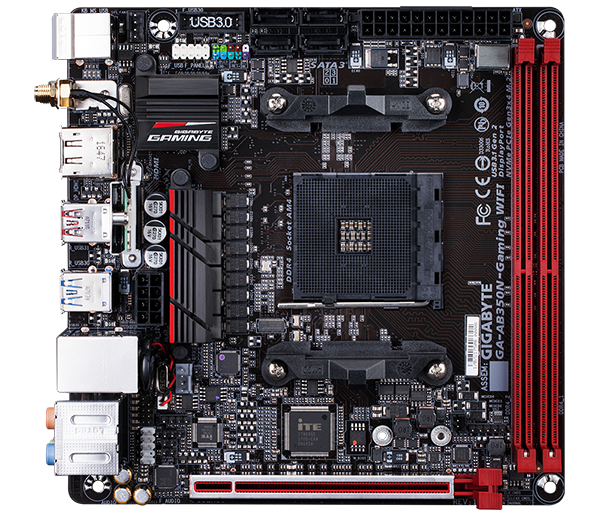 There appears to be no obvious limitations when compared to ATX boards as there's fine-grained control for voltages pertaining to the CPU, GPU and overall SOC. 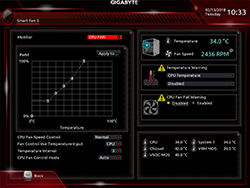 However, when testing with the Ryzen 5 2400G, even with the T20h BIOS, the board wouldn't apply a firmware-set GPU overclock - anything other than auto (1,250MHz) wasn't active. Do also be aware that you need to have a fairly recent BIOS installed in order for Ryzen second-generation processors to work.